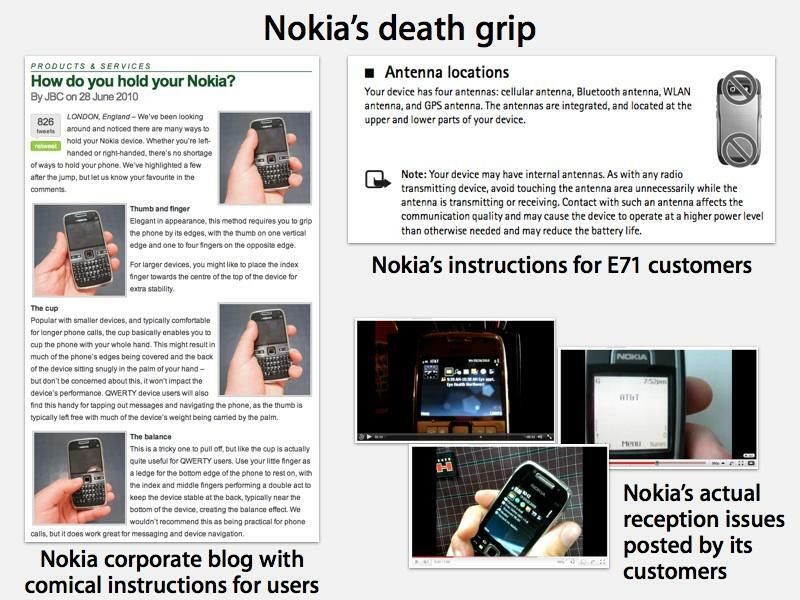 Nokia's official blog has jumped on the iPhone 4 "death grip" bandwagon in a posting that suggests the company's mobiles don't share the same issues related to blocking a phone's antenna, despite having earlier published instructions that tell users to avoid holding its phones in a way that might block the antenna. Today's Official Nokia Blog post drying asked, "How do you hold your Nokia?" It posts a variety of pictures of a Nokia phone being cupped by a user's left hand, the same thing that is reported to cause a drop in reported signal (although not necessarily in call performance) on iPhone 4. "The key function on any Nokia device is its ability to make phone calls," the company's official blog posting says. "Providing a wide range of methods and grips for people to hold their phones, without interfering with the antennae, has been an essential feature of every device Nokia has built." It concludes, "Of course, feel free to ignore all of the above because realistically, youre free to hold your Nokia device any way you like. And you wont suffer any signal loss. Cool, huh?" Another Nokia customer posted the official user instructions from his Nokia 2320, which depict the phone with a graphical "do not" swipe across the bottom antenna section of the device, and explicit instructions to "avoid touching the antenna area unnecessarily while the antenna is transmitting or receiving." Nearly identical wording appears in Nokia's printed manuals for its other phones, including the E71, as reader Mark McCormack sent in (pictured below). That's the same model Nokia appears to be presenting in its blog page, where it asserts there is no way to reduce signal by holding the phone in a different way. Nokia's manuals say otherwise: "Contact with antennas affects the communication quality and may cause the device to operate at a higher power level than otherwise needed and my reduce the battery life."